TOKYO - The Japanese government plans to draw up guidelines for underwater drones by fiscal 2020, reflecting the need for rules to prevent accidents as the use of such vehicles by the private sector is expected to increase, according to sources. Underwater drones, also called unmanned submarines, are used for such purposes as checking offshore wind power plants and underwater pipelines. The vehicles, with electric motors, move under preset programs, collect data and send it to mother ships and base stations through communications using light or sound waves. Underwater drones are also utilized for collecting data on seabeds and their geological features. There are remote-controlled models as well. In Japan, entities such as Kawasaki Heavy Industries Ltd., IHI Corp. and government research bodies are developing underwater drones, utilizing their know-how cultivated through developing submarines. Mainstay models are 2 to 3 meters long. Some models can dive to depths of several thousand meters. Underwater research is usually conducted by divers, or by sinking equipment connected to cables. It is estimated that the cost of checking underwater pipelines can be cut to one-third by using underwater drones. According to the Land, Infrastructure, Transport and Tourism Ministry, the market for underwater drones is expected to reach about $1.2 billion (S$1.6 billion) in 2023, up from about $200 million in 2010. 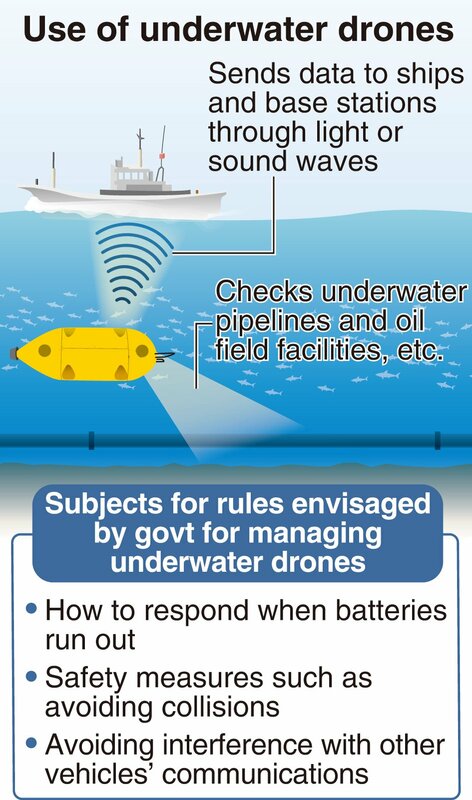 However, trouble is anticipated if the use of underwater drones increases, such as collisions with ships and underwater facilities, or drones becoming lost under the sea. To deal with such situations, the infrastructure ministry plans to draw up guidelines for measures to prevent accidents, and to deal with them when they do take place. For example, the guidelines will require makers to install mechanisms to avoid collisions, and to collect drones once their batteries become depleted. To meet the demand, makers are expected to equip drones with functions such as halting themselves if other vehicles approach, and rising to the surface once their batteries go under a certain level. The Civil Aeronautics Law prohibits aerial drones, which can be used for such purposes as taking aerial photos, from flying around airports and densely populated residential areas without permission. The necessity to prepare rules for underwater drones has surfaced as a similar issue to tackle, as there are almost no regulations on aspects such as where to use them.